0.1 How Does a Ceramic Heater Work? Winter is here and if you haven’t got your heater to survive the season, you must be suffering right now. But don’t worry! It’s not too late to get yourself a ceramic heater to get a good night sleep in a few nights’ time. 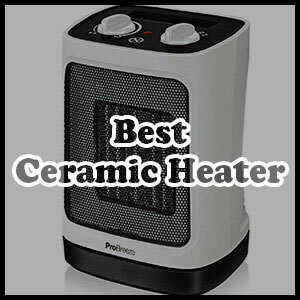 But firstly, you will need to go do a good research on a safe, reliable and efficient ceramic heater for your home. That’s why we have compiled 6 different ceramic heaters that are not just popular but also does the magic at your home. We will also answer common questions about ceramic heaters and guide you in choosing and maintaining your ceramic heater. So, how exactly can ceramic heats up a room? The heater is called a ceramic heater due to the main heat conductor, durable ceramic, that is heated up with electricity. A ceramic heater can be a radiant or convection heater depending on how it works. A radiant heater works by having the heat slowly dispersed after the ceramic heater is hot enough. The heater becomes a convection heater when a fan is added, which is usually the main component of a ceramic heater. The fan will then blow the heat across the room, encouraging hot air to circulate through the air. Ceramics are some of the best heat conductors we know and are not expensive to use. At the moment you turn the heater on, the heat is almost instant and preheating is unnecessary. The Lasko 754200 Ceramic Space Heater is a portable electric heater that Lasko is very proud of. There are more than 8,000 5-star reviews containing praises of its affordability, mobility, and efficiency. These are the three main characteristics of the 754200 model from Lasko. This is a convection type ceramic heater which blows out hot air to the space around it. The heater is in the color of silver and has two manual settings you can set. One is the strength of the heat that you want. It ranges from fan only, low heat to high heat. The other setting is the adjustable thermostat which has 11 different levels, making it easy for you to choose just the right heat for the room. These two settings alone already give you the flexibility you need and saves your electricity bill. 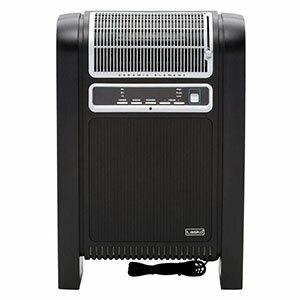 The space heater works at 1500 watt, suitable for small rooms like your office or study room. Since it’s very small, you can carry it around and heat up space around where you are working or where activities are done. It also has an overheat protection which is supposed to prevent it from burning things. But due to its cheap construction, it has no feature to shut down when turned off. The material is also not of the best ones, so you cannot bet that it won’t try to melt itself (which could be higher due to rough delivery or problems during manufacturing it). It has several issues on that, although most of them were due to plugging the heater into sockets that were couldn’t withstand the energy consumption. The thing that we love about this particular product is its affordability. Within $30, Lasko manages to design a compact space heater that works its magic and warm up space the way you want it to. The previous version focuses on the functionality and mobility as well as made to be affordable for anyone. This time, Lasko comes up with something more aesthetic, releasing the Designer Series of a ceramic space heater. And it surely is a touch that is functional but also satisfying to see. It is also another convection type ceramic space heater. 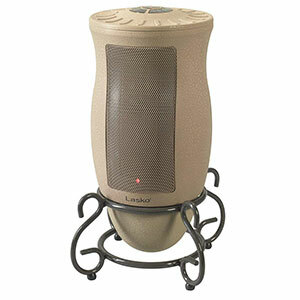 Lasko 6435 Designer Series Ceramic Space Heater is shaped in the form of a vase with a stand. The fact that it looks like a ceramic vase will fool those who don’t pay enough attention to the buttons on top of the vase. 4 different settings give you the flexibility to heat up the room at the right temperature and speed. It has an adjustable thermostat at 5-degree increment from 60 to Max. Fan speed can be set high or low. You can set the direction of the blow by using oscillation mode or keep it on to spread the heat across the area. The timer can be set from 1, 2 to 4 hours long, ensuring that your heater does not stay on for too long and you can sleep peacefully. Overheat protection prevents any fire possible fire hazard or damage to the heater itself, shutting down when it has to. The exterior is also designed to remain cool to the touch, making this a safe piece of furniture for kids. It also comes with remote control, so you don’t have to come over to the vase to set the heater! 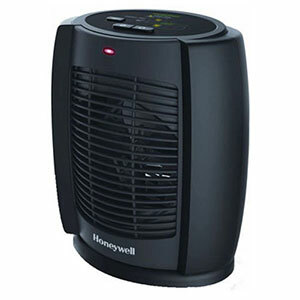 What Lasko affordable 754200 space heater model couldn’t do, Honeywell HZ-7300 Energy Smart Heater can. It is designed to be portable and easy to carry around as well as cool to the touch. The exterior is made of a material that does not touch the ceramic directly as well as do not absorb heat as quickly. What Honeywell has an advantage against the affordable model from Laskoare its safety standards. Most portable and mobile space heaters do not have auto-shutdown when accidentally tipped over. It is the feature that is very important in any household that owns dogs, cats or has young children in it. The kit is also equipped with overheat protection. There are two things you can customize on this particular space heater. The thermostat is adjustable and there are two different heat settings, high and low, for your comfortable heating customization. And if you couldn’t see your energy consumption in heaters most of the time, this one lets you see how much you are using through its Digital Energy Smart Technology. The fan can use oscillation mode, which allows heat to be distributed fairly throughout the room or you can use it to set the fan to blow in the right direction. It is a convection style space heater which draws heat almost the immediate moment you turn it on. It’s an overall space heater that focuses more on the safety part. It shows you the energy consumption indicator, is equipped with an automated shutdown when tipped over and cool-to-touch exterior. The right space heater if you want your house to remain a warm and safe haven for your little ones and pets. Brightown is a strong competitor when it comes to providing the affordable ceramic heaters that work wonder. It is constructed with many similarities to Lasko’s 754200, except that the handle here is protruding out permanently. It is mobile and can be carried around the house wherever you want it to be. There are two main settings you can adjust. The thermostat, of course, can be set with high flexibility and together with that, the heat mode. You can use high heat mode that uses 1500 watt per run to warm up during cold winter nights or just set it at 750-watt-low mode during the day. Saves your electricity bill, saves the energy you use. The heater is claimed to be quiet, but as a matter of fact, a small, white noise can be noticed if you were to sleep while it’s turned on, for example. Depending on people, some praise it as it helps them sleep while others think it’s annoying. It’s the noise from the fan and on high-heat mode, it may sound a bit louder than usual. It’s interesting to know that the heater won’t turn on if the surrounding area is detected to be warmer than the temperature you are using. This built-in system prevents the heater to operate when it’s dangerous to use and to top it off, it has an overheat protection mode that automatically shuts it off once it reached 158 degrees Fahrenheit. 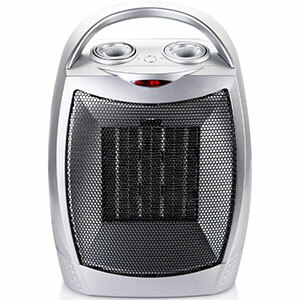 Let us also mention that it is very affordable – less than $30 for this small, powerful heater. The only drawback would be the white noise from the fan which might not be a problem for everyone! 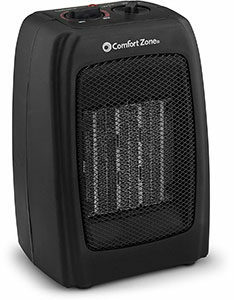 Comfort Zone is a famous brand that works on manufacturing ceramic space heater and always makes sure that they only sell standardized products. It comes in black color only and has a modern design that makes it look like a speaker. Operation of this ceramic space heater is convenient and easy like other space heaters. You can use the adjustable thermostat to set the ceramic’s heat at the comfortable level. You can also set the heat mode on high and low or fan only. These are the settings that you will need to get the right heat level. The heater has PTC, Positive Temperature Coefficient heating system, which is a special technology that helps spreads the heat more evenly. With that, the heater is designed with a handle that makes it easy to carry it around. This is a small, powerful but still affordable choice for many. One prominent problem is that the heater has quite a loud noise. This might not be the choice that you should make if you like your room to be quiet while this is operating. 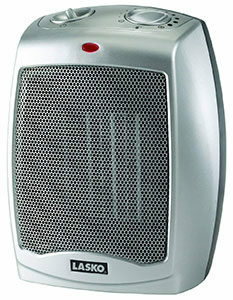 ETL listed ceramic heater from Lasko is a high-class choice for your space heater. The ceramic space heater is not designed to be portable or mobile as it does not have a handle like the others reviewed here. However, it is designed to easily snug next to the wall, as if it was meant to be there. You can easily operate it with a remote control or you can just set it manually. The heater comes with 1-, 2-, 4- and 7- hour timer as well as an adjustable thermostat. You can have it operate on high or low heat mode or fan only. The design is convenient, modern and easy to use. The maximal output of power would be 1500 watt. It is also equipped with automatic overheat protection, meaning there is less chance of the heater potentially melting itself. Due to its sturdy design, it is also harder for animals or children to tip it over. For the price that you pay for it, it’s certainly a space heater that saves space and is very safe to use. Heat is equally distributed through the Glide-system Pivot that can oscillate. On the other hand, you can also set it to only blow hot air to a certain direction. The very main advantages to using a ceramic heater are that it tends to be safer than other types of heaters. Ceramic heaters use durable ceramic which is heated up using electricity, but not to the point that they are burning. Oftentimes, you can’t even see ceramic heaters glow, but the heat is there and it’s being blown nicely into the room. Fire Hazard: Fire hazard from the heat is usually the least concern since it does not burn anything. It’s a hot piece of ceramic which is being blown out with a fan to disperse the heat. However, on ceramic heaters made of lower grade materials, when operated on high heat, may cause the exterior to melt which is where the fire hazard lays. There is also the problem with electricity consumption which may actually melt the socket, not the heater. Energy Efficient: It is also energy efficient because it does not burn on gas or oil, two types of resources which prices are always fluctuating. It mainly operates on electricity and consumption amount also depends on how much heat output you want. Equal Warmth: It also provides equal warmth to the zone of the heater. Convection type space heater uses a fan to blow the heat across the room and with oscillation mode, it’ll work like an air-con, except that it warms up the room. Unlike infrared heaters which shoots heat directly onto the object (and the air in the room remains cold most of the time), within enough time, you will get a completely warm and toasted room. Portable: Ceramic heaters can be made into light, portable heaters that you can move around the house. If heating up the whole house costs too much electricity, this small thing will get the heat that you want at a much lower price. It can warm only in one direction or oscillates as most ceramic heaters, even cheap ones, can do this. Check the product’s safety standard which could include overheating prevention that shuts the whole thing down immediately. It should also be equipped with an automatic shut down when tipped over by your pets or children. It’s best that the heater has a timer option and you need to test this during the day instead of immediately relying on it when you are sleeping. At receiving the product, make sure to read the official manual or guide that comes with the product. Most compact ceramic heaters come fully assembled, so you can just take them out and plug them in. It definitely should not be producing weird noises or smells at operation. If you notice anything like this, turn it off immediately and unplug the whole kit. Move it to a place where kids or pets won’t get near it and contact the customer support of the brand immediately. Add that you have also followed all the troubleshooting solutions showed on the manual. Make sure to check the status of the socket that you are using. We have noticed a lot of reviews with burning outlets which actually started from the fact that they plugged the heater and was actually drawing too much current from it. Make sure that your outlet is suitable for the amount of power that is needed and there are also heaters that come with energy consumption indicator. You absolutely must not leave the heater on unattended for more than a few minutes because it takes only such a short time for a problem to arise. Your pets could be tipping it over and the safety system somehow did not shut it down immediately. Maybe the power socket overheated and melted the tongs and cable, starting a fire. Anything can happen, but it won’t be much of a problem if an adult is there. We’ve been talking about the advantages of a ceramic heater, so now let’s see how it performs against two biggest competitors: oil-filled and infrared heaters. The most relevant advantages that both have is the efficiency of their operation. While oil-filled heaters require fuel to operate on, it does not necessarily burn them to produce heat. Just like how ceramics are heated up, the same thing is done to the oil. But comparably, an oil-filled heater will proceed to warm the room through its radiant. It holds an advantage against ceramic heaters in terms of noise pollution and the capability to warm a room. Since it does not have any fan whatsoever, the heater is usually completely silent, suitable for your bedroom or audio room. The heater takes quite some time to heat up, especially if you shut the heater down for hours already. But turn it on long enough and you’ll have a really toasty room. But price-wise, an oil-filled heater is usually for expensive. Although you don’t have to change the fuel as it doesn’t burn at all, you need one that is properly sealed to prevent any leakage. There is also a higher risk of fire since it’s filled with fuel that can burn. If most heaters heat up the room by circulating the air or radiating the heat onto surfaces, infrared heaters warm you up from the inside. This is why many manufacturers would market their heaters as energy efficient, heating you up almost instantly and saving all those energies from heating up the air or other unnecessary surfaces. But on the other hand, it does not heat up the air around the surface, which means that if you turn it off, the heat will leave almost immediately. But a ceramic heater circulates warm air around the space, and then slowly warms up the room. At the time you turn it off, it will depend on how cold it is, but the heat will remain for some time. How efficient is a ceramic heater (compared to other heaters in general)? A ceramic heater does not burn on fuel and the durable ceramic is a strong material that easily heats up. That’s why a ceramic heater easily heats up the instant you turn it on. That’s already a lot of electricity saved if you compare to quartz or other types of heaters that need preheating. Then, the heat will warm up the room in two different ways. Most use convection heating where a fan will blow the heat off the ceramic and into the direction you want. The other is a radiant technique that will radiate heat and is usually quieter. Does it release a toxic substance into the air? No, a ceramic heater does not release any dangerous gas or residue. It operates completely on electricity that warms up the room. Therefore, if you leave this overnight, you won’t have to bear the risk of dying from dangerous, toxic gas. Why does using an electric heater caused dry air in the room? When the heater is turned on, a draft from outside the room enters the space through leaks and the opening of the door. That draft is very dry especially if it’s very cold out there. The moisture that you have at home comes from you taking a bath, cooking or warming up water. While the heater keeps the room warm, it does not add moisture into the room. The fault doesn’t lie on the heater, but it’s the fact that the room and the draft that sneaks into the room is both dry. There’s also the fact that it depends on the current temperature, not just the humidity, that will affect what you feel against the actual humidity level. Can a ceramic heater catch on fire? If you set the heater on fire, yes, it will. Aside from the joke, a ceramic heater that is used in the right settings under cool temperature will not catch on fire. 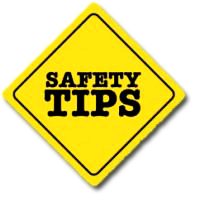 A heater that is plugged in a socket that cannot draw the necessary current can cause the cable to melt, so make sure to be careful about it. Each type of heater is distinct in terms of price and quality. Remember that cheap does not always low quality and expensive will never guarantee satisfaction. Lasko is a famous brand that manufactures various types of a ceramic space heater with a wide-variety of affordability. But, most importantly, we urge all of you to pay attention to safety tips before operating any of your space heaters. We hope you guys stay warm this winter! We are here to help you. Call us and we will reply to you as soon as possible.